Why wouldn’t you use a furled leader? Skip September 11, 2018 RECENT, Slide No Comments on Why wouldn’t you use a furled leader? Photo credit Blue Sky Furled Leaders. So, furled leaders are new, right? No. They’re older than dirt, but that would be in fly fishing time. Think braided horse hair in England and go back to the late 1400s. In 1496 Dame Juliana Berners, an English nun of the “manner born” (upper class) is credited with authoring A Treatyse of Fysshynge With an Angle. 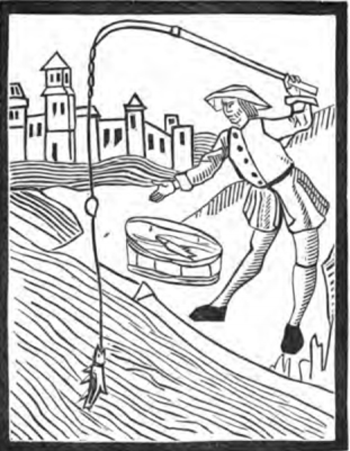 The book is the earliest known reference to fly fishing using a furled leader. Subsequent fly fishing books refer to Dame Berners explanation of making a braided (furled) horse hair leader with drawings showing how to braid the hair using three strands along with how to select horse hair, dry it, and store it. “Reel-Lines are made of horse-hair (from a tail), of silk, or silk and hair mixed, of Indian-weed, and of silkworm gut. It is usual for the amateur fisherman to purchase these lines, which are made by a small machine, but sometimes the angler prefers making them himself, and if at all handy, he may do this with great advantage by the following mode, which is much superior to the twisting-machine . . .” Eclectic Angler. The furling of horse hair and later fabrics got more sophisticated over the centuries but making a leader in that form, furling, lasted for 500 years. Today, think monofilament, which has been around for less than 100 years. 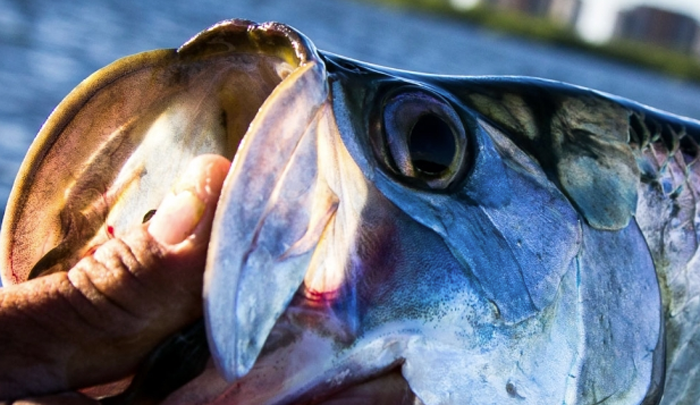 Most users of furled leaders are riverine, still water, or mountain stream fly anglers, but a better application for a furled leader, either monofilament or fluorocarbon, would be briny dwelling fishes – from tarpon to bonefish, but it has low acceptance there? • It’s knotless, tapered smoothly. • A furled leader has NO memory. Leave it coiled in your trunk over the winter, come spring it will uncoil straight as a laser and be as limp as it was when you bought it years ago. Click on image to visit Bly Sky website. • Use a tippet ring and it will last interminably. Several seasons, but just changing out the tippet section and fly is primary. In salt water that would be tippet, bite guard and fly. 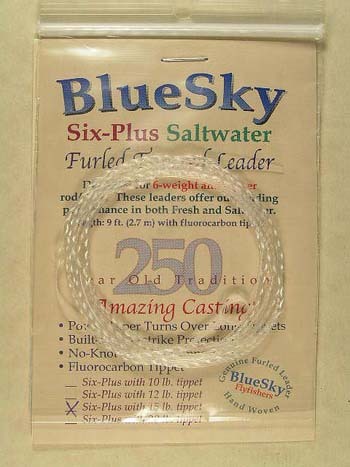 • Contrary to your belief and observation, a limp, furled leader will turn over much easier, make tighter loops than a stiffer, multi knotted, step down, single strand monofilament or fluorocarbon leader. Its bulk is not a negative when casting, it’s a plus. • The inherent shock absorption feature of furled leaders will catch any angler more fish than any single strand mono or fluoro leader because of that shock absorbing factor. Click on image to visit Appalachian Furled Leader Co. website. • The most heralded performance of a furled leader is its unmatchable butterfly fly landing. A dry fly purest’s dream come true. • A benefit not often mentioned is that a furled leader provides more water surface tension and that leads to longer roll casts, or longer casts when water tension is relied on. • Although I never heard of a furled leader kinking, it’s assumed that it’s possible. With a single strand, multi-knotted leader a kink WILL occur sooner than later. 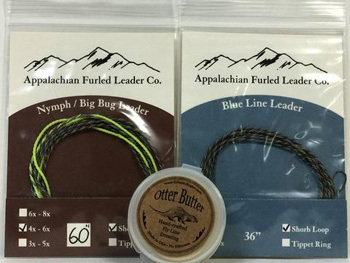 • The cost of using an extremely durable and long lasting furled leader has economic benefits and makes changing out flies so much easier – so much quicker. That’s also true with a tapered leader and tippet ring. • The best application for a furled leader is saltwater. • It will collect debris, but not the same way a step down knotted leader will – clumps at the knots. • It sprays water on put and take just as any step down, single strand, multi-knotted leader will. • In high wind conditions it is more subject to giving up its inherent benefit. However, high wind conditions are a bear no matter your leader choice or casting skill. • A drawn or tapered leader with a tippet ring will also last a long time. • No currently known volume of added floatant will keep a day long used and fully wetted mono furled leader a great floating leader.